← Touch Loops release 5 new sample library packs ! 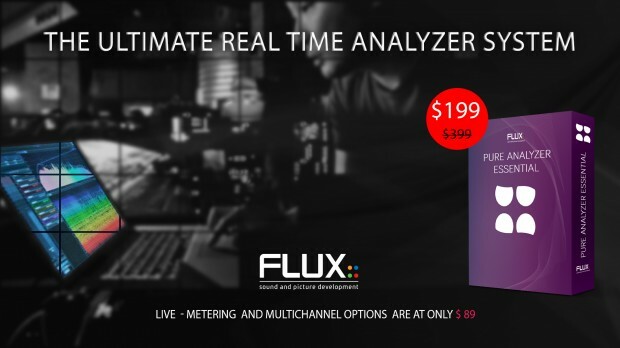 Flux:: Pure Analyzer Essential and Options at Half Price ! The foundation of the Pure Analyzer System is the Pure Analyzer Essential, with a comprehensive range of analyzer options for any imaginable audio analysis and measurement, which can be expanded for more specific utilization with up to three add-on modules; Live, Metering/Loudness and Multichannel/Surround. The Pure Analyzer Multichannel Option provides a vast range of measurement tools for the most demanding multichannel environment. In addition to standard spectrum analyzer and metering tools, an innovative set of spectrum tools, Flux:: Nebula, presenting frequency and scope over space in a fashion never seen before. The Pure Analyzer Metering Option provides an extensive set of measurement tools well adapted for Broadcast and Post Production facilities, presenting the metering tools for a vast range of standards such as True Peak, RMS, ITU-1770, EBU-R128 (PLOUD), history and more. The Pure Analyzer Live Option provides the elements needed to assist the live sound engineer in speaker array calibration tasks, a delay finder, level, meter, transfer function magnitude, phase and coherence spectra, and impulse response, as well as snapshot facilities. This entry was posted in DontCrack, Plug-ins, Promotions and tagged Broadcast and Post Production, EBU-R128 (PLOUD), Flux, ITU-1770, Live, Metering/Loudness, Multichannel/Surround, Pure Analyzer Essential, Pure Analyzer Essential Options, Pure Analyzer Live Option, Pure Analyzer Metering Option, Pure Analyzer Multichannel Option, RMS, True Peak. Bookmark the permalink.